great crayon talents! laughed about the poop behind the animals! was wondering if the poop fertilizes the earth, can it be useful? 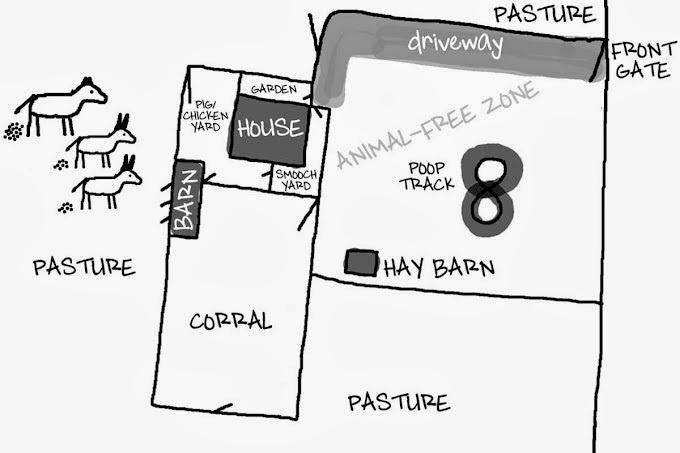 Great map.....I keep wondering if Johnny Cash Cat will get a friend, or if you have decided it is a one cat barn? And...are you 100% healed from your surgery? I've got questions about hay. How much hay do you use in a day? How much do you use in a year? Here in the lush, ice crusted Northeast, I have to feed hay during the non-growing season and then I feed none during the green times. Is it ever green enough there for the gang to eat only forage? In a photo earlier this week, it appeared the chollo was blooming....a yellow flower possibly? It's good when life is quiet and all is well. Have a great weekend. How far are you from your closest neighbour? what is the "crime rate" of your neighbourhood? Nice setup. I was wondering if George or Allen are trained in any discipline I.e. driving? I know they are very talented in being funny and are cute! Also, do you ever get lonely or scared being out so far from people? Thanks for this, I too have been confused about the layout of Adventureland. I love the fact that the animal-free zone is so tiny, it's like a reverse zoo. I'm curious about your juniper battle--is an ongoing kind of thing you have to keep stomping down? Any potential re-treatment with the tree grinder? Do you use the rotted down poop for anything? What and when do you feed? Are you going to get a new house cat? How are the egg production levels? What will happen when your hens quit laying? What is in your garden? Exactly what is that fence around Smooch's yard; is it something you can buy or was it made for you? No questions, but thanks for the diagram. It will make it easier to imagine the area the animals are travelling. Can you demystify the ear language employed by equines? I understand the body languages of cats and dogs but feel like I'm missing out on half of the conversations your photos document. You know those info graphics that explain cat body language? Perhaps one of those on equine ear language would be useful for those of us who love to read along but have no equine communion opportunities. Thank you for considering this request. Can you show us how far you are from the nearest town with a map similar to this one (is that where your walmart is?) also, would love to hear your thoughts about living alone out there, pros and cons. Do you take any special precautions like always having your cell phone charged and on you? I know you're super resourceful so I'm sure you have some sort of plan! Signed, Seemingly nosy but really just curious! The 'trail' amazes me. It's gotten so deep that it's a wonder that they still use it. 1. Have you seen Mr. P lately? 2. Do you have bobcat, mounain lions, or javelina there? 3. How's your Mom doing? Wow, that's a lot of questions. I also wondered if you used the "composted" poop from your track. Can't wait to hear all the answers. Hello, Linda, this is Dianne. Thanks for this post, it's great! Now I can picture you and your family going about your day. How about a diagram of your house layout? I'm like a Dickens character, I guess...("More, please?")... I really like how you have furnished and decorated your home, especially the colored cement floors. I might could give you blog ideas 'til the donkeys come home. I wish I knew how to do a strikeout for cows there. Thanks again. Is Johnny ever going to have his own cat door? How deep is your well? How many gallons per minute do you get? And yes...tell us how you write on your photos. How about a tutorial? You are terrific with your drawings! Thanks for the map Linda, really helps put it all in perspective.
} feel like the Spanish Inquisition ??!!!!!! Glad the only big ACTION around your place is questions. I think you had enough last fall for a long time :) Somehow I think a project is brewing in that head of yours . . .wonder what it will be? Do you use the Walmart on the East side of the mountains, or down in Belen/LL? I know you use the same vet as I do when you take Wynonna in....sometimes I wish I could just pop over to the other side of the mountain and have margaritas with you! I know we live 'close'. I always love your drawings, and appreciate having a better picture of your layout in my head. I, too, would like to know how you write on photos - I am hopeless at it! And...does Wynonna get to wander into the front 40? Back 40? Is she donkey-and-horse savvy or would she get herself under their hoofs and be kicked? Ouu weee new material! I was interested out the hay question too. We only need to feed in winter months when grass isn't good enough. Then some of the horses get muzzled in the summer because the grass in too much. Poor babies. How about the chickens? How have they been? Any snakes or nasty spiders lately? Those are always good to read first thing in the morning. Wakes me right up! My gosh, I have been reading your blog for well over two years and I did not realize, that yes you really have a back 40 and a front 40. Mercy. I am sure you will be writing about snakes in no time...my favorite....not really, but I enjoy a good scary photo. What kind of food to you feed Smooch? She has the best coat, so glossy in every picture. Have a wonderful weekend Carson! you used to write about some food recipes you were creating. any new recipe, new vegetable you are testing at 7 msn? did you ever consider growing some veggies in your backyard? Why does Lucy look so different from the "boys" ? I guess I need a primer about donkeys. So many great questions! I'm ditto to them all too! Especially the ones about a tour of your home. I love seeing your cozy deep burgandy leather (?) chairs, cozy pillows, artwork, and bright cheery walls. I LOVE your sunroom. I wonder about how your herd does with vet visits. Do they take needles and treatment without a fuss? Did you have to train Alan and George? You seem to do your work online ... what is your line of work? How did you end up with Wynonna? (I need to thank you for 'Breaking Bad'. Have to admit I thought it was some kind of 'horse series' when I read about your Breaking Bad Marathons! We now have finished watching the first two seasons on borrowed DVDs. Have the rest of the series still ahead of us!) Love, love, love reading your daily musings. Hugs from SNOWY (yes STILL SNOWING) Ontario! I didn't notice anyone else asking my question so here goes... Animal free zone?! Why? Could you tell us Smooch's history? Such as where and when you got her. How old was she and what was she like? Has she always been the ranch protector, or did she have to grow into the role? Wow! You have enough questions to get you through for a while. I really loved seeing your layout. 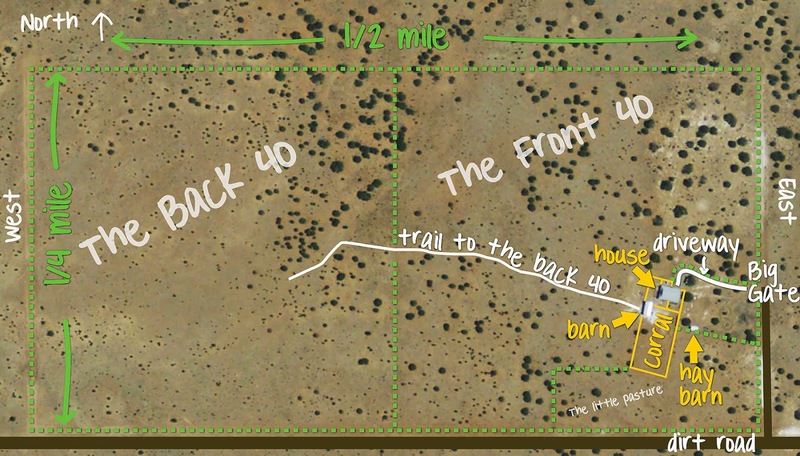 It seems like your poop track is so close to your house. Is really as close as it appears? How do you handle all the flies? How did the "pocket hose" work? Always looking for an unkinkable hose. Funny you should ask...I just finished Monday's post and it's all about Fish.